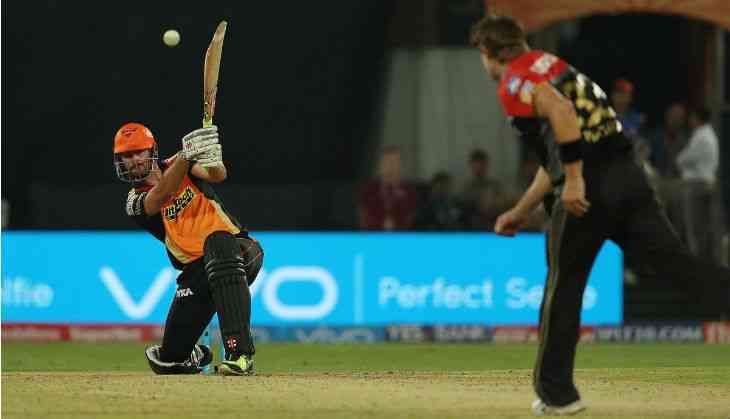 Defending champions Sunrisers Hyderabad made a perfect start to their Indian Premier League campaign crushing a depleted Royal Challengers Banaglore by 35 runs in the opening encounter, here on Wednesday. Veteran Yuvraj Singh's blazing blade (62 off 27 balls) and unheralded Afghanistan leg-spinner Rashid Khan Arman (2/36 in 4 overs)'s crucial breakthroughs enabled Sunrisers to outwit a Virat Kohli-less RCB in all departments. A challenging target of 208 was achievable on a placid track but RCB could only manage 172 in 19.4 overs losing wickets at regular intervals. This was the first time after 23 IPL matches that RCB were all-out. RCB's top four --- Chris Gayle (32), Mandeep Singh (24), Travis Head (30) and Kedar Jadhav (31) were all set before getting out. Kedar's dismissal was the turning point as RCB were never in the match after that. The India international was looking dangerous during his 16-ball stay and was run-out when Ben Cutting's direct throw from the deep found him short by a metre. On a belter where pacers became easy prey for the batsmen, Sunrisers skipper David Warner rotated his spinners well trying to take the pace off the deliveries. Young Rashid, who created history by being the first Afghan to play an IPL match got Mandeep with a fuller delivery that didn't turn. The batsman trying to cut got an inside edge onto the stumps. The celebration was atypical Shahid Afridi just like his style of fastish leg-breaks. Rashid also got Travis Head when the batsmen tried to play a slog sweep. But Deepak Hooda got the most important wicket when he got Gayle trying to hit him over long-off for a second six only to be caught by Warner. Th wickets fell at regular intervals and there was no pressure on Sunrisers as they coasted to victory. Ashish Nehra (2/42) also gota couple of wickets to reach a personal milestone of 100 IPL victims. Earlier, a vintage Yuvraj hammered RCB bowlers to submission as Sunrisers Hyderabad posted a commendable 207 for 4 put into bat by Shane Watson.